Conditions were perfect on the stream, even though this particular river runs low all the time these days. Releases from the dam don't pump enough water into this stream to make it the "success" that it really could be. But that's a discussion for another time. We were both into fish right away, and coincidentally both lost our first fish. But I quickly figured out where they were hiding, and using the magical powers of polarization, drifted the fly to enough fish to have a "many" day. Soon the sun made an unexpected appearance, chasing the clouds and the last of the misty rain away for good. This made the fishing more difficult, but luckily there were plenty of opportunities to cross the stream as needed to avoid casting a shadow. It appeared that most of the fish I caught were small wild browns. I do not believe they stock fish in this section of the river. If they do, they aren't this size. This was one of those days where you really get to appreciate the beauty not only of the surroundings, but each fish's unique markings, as well. Mosses and Lichens were showing their love for the weather, and it was hard to pay attention as I was drawn from one aspect of my surroundings to another. A surprisingly large crayfish lurked in a muddy side-pool, and I made sure to snap a photo. But then my attention returned to fish as small rises started in the riffles and then the larger pools as well. Sight-fishing to a few rises and throwing different kebari for fun all day made the point that in a place like this, the fly truly doesn't matter. Fishing with the Oni rods is really suited to fishing soft hackle flies. I enjoyed the opportunity to cast the rod openly along most of the stream. The fish seemed interested in almost everything as long as I didn't let them know of my presence. As our time ran out, we reached a good spot to turn around. There's plenty more to explore on the next trip, but it may be a while until I can return. There is a beautiful and spiritually important place where history runs deep - stories of Native Americans and Colonists intertwine with a natural place of such mysterious beauty that it is almost impossible to describe. Such a place does not lend itself to being treaded upon easily... but if you tread lightly enough and with a good-hearted intent, it may allow you to pass, and in doing so, experience something that could almost be frozen in time. Of course, such places also hold untold treasures in the form of beautiful wild trout, so I packed the Oni type III and my Daiwa Soyokaze 27sr, ignored the weather report, and headed up into the ravine. While this may seem like the end of the trail, with some risk and an enormous amount of effort, one can barter for entry into the deepest and likely the most remote ravine in the area. This is no simple feat, as the gradient is as steep as can be, and the obstacles are many. And as one overcomes each of these obstacles, thinking, or just hoping, that it could be that last, another pops up to deliver yet another challenge. But after some well thought out moves and a bit of slide down some slippery leaves, entry into the ravine is granted, and a scene relatively untouched unfolds before me. The last time I visited this place, the fish were as plentiful, and many were larger. However, with less water flowing and a very different winter behind us, I accepted that this was simply the flow of nature this year. Each crystal-clear pool presents a challenge of its own... unexpectedly beautiful sunny weather brings the challenge of casting shadows, while endless deadfall and snags lead to awkward angles and impossibly short drifts. ...delivering rewards, one colorful jewel at a time. And just when the pace has seemingly evened out, a new obstacle is presented beyond each passing mossy rock. An ancient log along the slick rock once provided a stairway to the next pool... yet some force of nature had washed it down and this may have spelled the end of this adventure. But as I scoured the walls of the ravine for another option, this raggedy year-old rope gave me the only risky option out of this predicament, so I took it. Studded boots created solid footing and it was not necessary to use the rope to hold my weight... but it provided a perfect balance point as a handle at just the right moment, and I was soon up and over the wall, looking back down. But soon I was forgetting all about this moment, and once again in awe of the scenery around me. One after another, these beautiful cascades were within my grasp. While the rain made momentary appearances, it was nothing compared to the high chances of thundershowers first predicted. 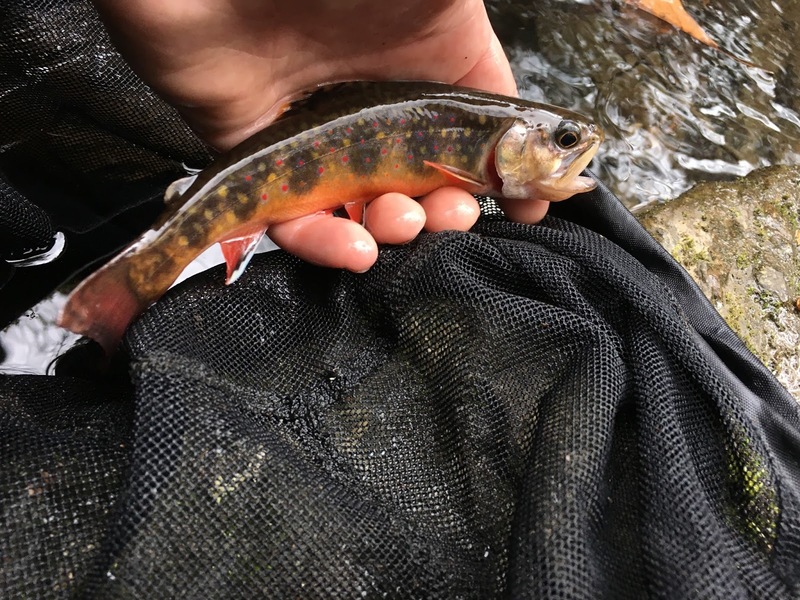 And in each of these pools below the cascades, colorful wild brook trout were brought to hand. My favorite pool, (and one that is particularly hard to access without doing the entire scramble up the canyon,) yielded the most colorful fish of the day from below the foamy depths. Recently blown-down trees had been washed into a few prime pools, making them new refuges for the few trophies in this mountain stream. And yet others were newly opened up for the anglers willing to put in the work to be in this place at the right time. A new rope, likely for swinging into a deep channel and going for a summer swim provided a wonderful way to extend my reach into the channel. Multiple beautiful fish were pulled from this pool... and quickly I fell into the trance of fishing to that one large, picky resident, seemingly asleep... failing to move even to investigate and reject my offerings. Even without the big ones, just being in this place was a reward in and of itself. I recognized many of the signs that I often see in deep ravines such as this... specific mushrooms, patterns of moss, dark-colored fish, and dead logs that created a certain magical feeling around me. My favorite streams run through places like this. The signs of wildlife, surely aware of my presence, were abundant - as were the first signs of spring on the forest floor. Having reached the top of the ravine, and after fishing all the best holes along the way, the rain began to fall hard; as if to signify that I was at risk of overstaying my welcome in this surely sacred place. I made my exit up a steep hill, finding a bushwack-trail along the edge of some private property. A quick view back up the hill of the upper ravine confirmed the epic undertaking, defining my journey in having traversed these cascades. And as if in solidarity with the theme of the day, a useful reminder awaited those who stopped to read it on the way out. I was surely very aware of the reality of the world around me on this day. Choosing to inhabit one reality within the world I live in as opposed to another had brought me to this fairytale location and delivered the rewards I had sought. "Become aware to the reality of the world you live in... so choose to spend your time and energy doing the things you love, not the things you don't."